Teacher time is spent on the moral imperatives that come with the job. Husband, father, and teacher. Hoping to earn full redemption through the written word and shaping the dangerous young minds of tomorrow. 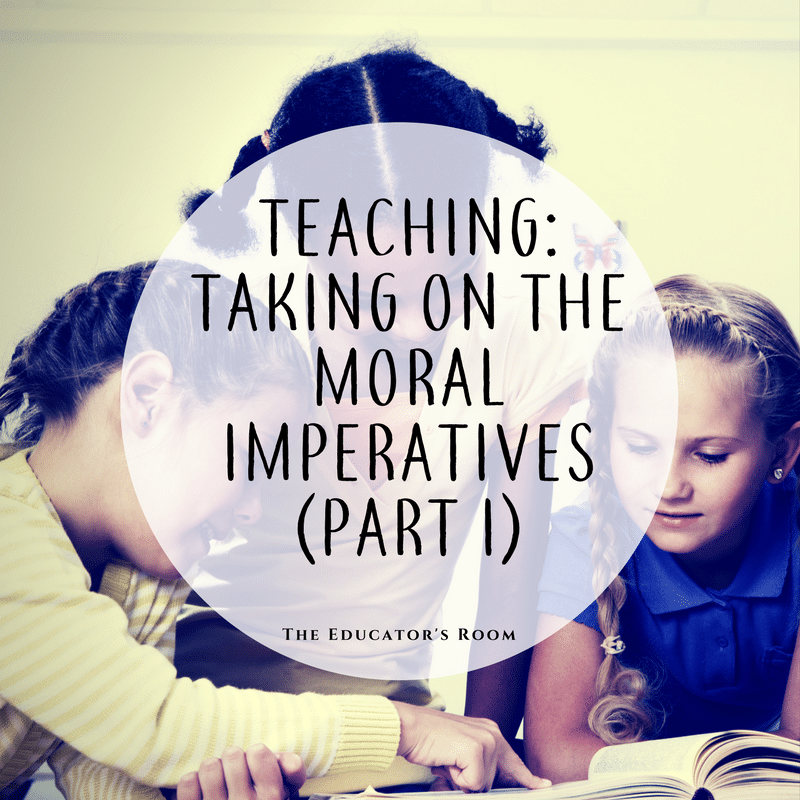 I have been thinking more about the moral imperatives of teaching. These imperatives can hinder instruction and progress. That’s why the only option is to address and hopefully resolve them. They are moral imperatives because it’s wrong to not handle them. Preparing students academically-now that’s the job, a duty. Consultants, education experts/leaders (folks who travel around and talk about stuff others do) mostly focus on that academic data. But teachers are on the front lines for children and dealing with much more than just test scores. They contend with the moral imperatives daily, and it’s one of the reasons we need good teachers so badly. They deal with things others wouldn’t and couldn’t deal with. That said, I’ve never assumed the power to teach to “change the world,” but I do understand that world. I see what it does close up. I know that other teachers do too. It imposes some horrible burdens on children, and those burdens become imperatives for teachers. It also means that teachers do more than “education reformers” care to admit. Criticisms of public education and teachers usually stick to an academic focus. You know: test scores, graduation rates, “college readiness”… These stats are used to define official expectations placed on educators. Then those stats are used to describe how schools have fallen short or failed. Having sprang from the metaphorical loins of wealthy elites’ and their desire to consume more of the public commons-this approach is no surprise. If you can attach lies, damn lies or statistics to something, it becomes easier to demonize and capitalize. It also becomes easier for the wealthy and politically powerful to exploit the weak and poor. Promoting the primacy of tests, data and accountability for others makes their brand of reform easier. Who avoids moral imperatives, and why? Avoiding the boots-on-the-ground moral imperatives is one way to provide “school choice” while keeping your load light. Taking on the more personal challenges of teaching in a truly public school is a daunting task, so having a system to avoid those challenges can help build reputations and an industry. That’s why offering “school choice” to parents requires parents to be involved and aware, and students to “fit” the choice a school provides. Regardless of the petulant foot-stamping that might come from some advocates (I am a choice advocate, but not a foot-stamper) “choice=reform” ain’t really a public education model. It’s more of a market that sorts the most vulnerable to it’s own benefit. Still the praise for the sorters can be effusive and sometimes a bit over the top. If stats are the focus, it isn’t hard to understand why a consummate self-promoter like Eva Moskowitz would garner high praise. Admittedly, children at her Success Academy schools get opportunities they wouldn’t have otherwise gotten, and students are getting good test scores. But it’s certain children getting them, and she makes no bones about keeping some students out of her school or sending others on their way in order to avoid some of those moral imperatives. You remember teachers? This is an article about teachers and how they take on those moral imperatives. Few reformers are willing to include this type of recognition in their narratives about traditional schools. Psychological, social, emotional and physical abuse; homelessness, hunger… Teachers are faced daily with young people bearing these traumas, and they handle them in the moment. While plan books and academic pacing demand steady forward movement, teachers often spend time healing children in order to acacademically prepare them. If “healing” seems a little extreme (though I would argue teachers do heal), at least consider it triage. It has to happen in order to advance a large group of students with varied needs and abilities. So while the “poverty is not an excuse” crowd might praise and defend efforts to sort the poor before they are served, true educators know the impacts of poverty and dive in to serve them all. Some schools even explicitly implement programs to address the impacts of poverty. And their efforts go far beyond the simple-minded grit-and-rigor B.S. that test-advocates prescribe for . children Fairmont Neighborhood School in the South Bronx, for example, there is practice with intent when it comes to addressing the needs of their students., and clearly they understand the challenges their learners face. In this KQED article about Faimont, Anya Kamenetz describes a school wide understanding about the condition more and more students come to school in. Teachers, first off: your education, training, instincts and experience have already revealed the reality of that last quote to you. And if I haven’t already made it clear, I know you drive yourself crazy trying to heal/help/teach the children coming to school with these burdens. So be proud. That’s my first “to do” for you. Be proud. I am proud of you every day, and I don’t care what kind of school you work at. Thank you for your service, regardless. There is a growing body of children that desperately need you and your understanding more than they need an extra helping of “grit and rigor” served up by pious, elite reformers. Of course we want our students to move on to bright futures-but that requires much more than just being prepared academically. This is something those “arch-reformers” know but sidestep in their advocacy. Humility, reflection and appreciation are cards missing from some of their decks, though, so it comes as no surprise. Be fierce. Don’t be humble. The clowns looking for every opportunity to demean and diminish the importance and contributions of you, your work, our profession, of our schools…they are fierce. So you be fierce. That doesn’t mean be defensive or proudly complacent in what you do, what you have always done, and the way you’ve always done it. Of course change and grow. If you don’t, you really do become a liability. But don’t sit quietly and get rolled over by haters and opinionaters. Be fierce. Our mission is to serve children, not serve them up for approval.